Mr. Yaseen Anwar was appointed Governor, State Bank of Pakistan (SBP), by the President of Pakistan, on 19th Oct 2011. Mr. Anwar is the 17th Governor of SBP since its inception in July, 1948. 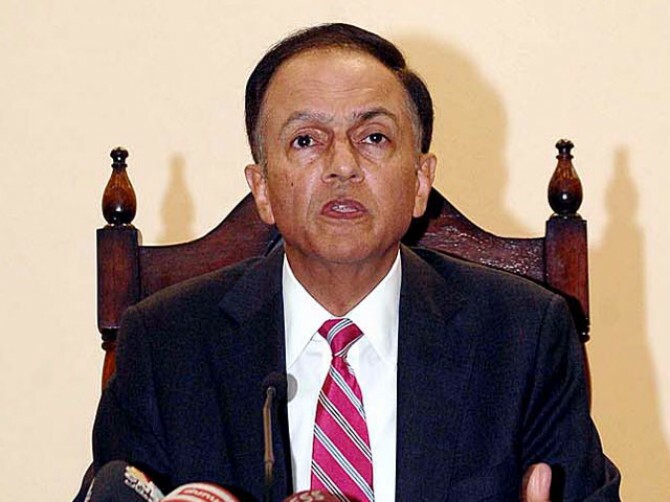 Prior to his appointment as Governor SBP, Mr. Anwar was appointed Acting Governor of the State Bank of Pakistan on July 18th, 2011 in which capacity he also served from June 3rd, 2010 until September 8th, 2010. Mr. Anwar served the State Bank as its Deputy Governor since March 29th, 2007 and managed all the four clusters of the Central Bank i.e. Banking, Reserve Management, Monetary Policy and Operations; SBP subsidiaries - Banking Services Corporation (BSC) and the National Institute of Banking & Finance (NIBAF). Mr. Anwar has served on the Boards of SBP, Pakistan Security Printing Corp. (PSPC), Policy Board of SECP, Board of NIBAF and SAARC Payments Council Board. He is Chairman of the Monetary Policy Committee (MPC) of SBP Central Board and has interacted with the IMF under the Standby Arrangement with Pakistan. He is also the Governor on the Asian Clearing Union (ACU) Board. As a senior global banker, Mr. Anwar brought 33 years of international banking experience to SBP. During that period he worked at major international financial centers that included New York, London, and Paris with JPMorgan Chase, Bank of America, and Merrill Lynch. As a result of this international exposure, he developed a deep understanding of corporate business relationships in the U.S., Europe, and the Middle East as well as a broad range of hands-on experience in managing rapidly growing business units of renowned global financial institutions with detailed knowledge and oversight of the Regulatory Environment, Capital Markets, Operations, Payments, Export Finance, Investment Management and Credit related matters. As a Non-Executive Director on the Board of United National Bank Ltd. (U.K.) for six years (2000-2006), he developed strong expertise in the U.K. financial services regulatory framework on corporate governance as well as senior level ties with the U.K. Financial Services Authority and the Federal Reserve Bank of New York. Mr. Anwar was a Vice President at Merrill Lynch & Co. for nine years in New York/London from 1992 to 2001 where he honed his skills in Capital Markets and Alternative Investments. Before Merrill Lynch, he spent 15 years at Bank of America from 1976 to 1991 in various responsible capacities that included Vice President & Section Head for its Global Export Finance Group and the Middle East in New York. As head of Bank of America’s Export Finance Group, he was the key relationship manager for the World Bank, Asian Development Bank, Export Import Bank, USAID and USDA. He was trained at JP Morgan Chase, New York during 1973-1975 after completing his Bachelor of Science degree in Economics from the Wharton School of Business at the University of Pennsylvania where he received a dual degree of BA in Political Science as well. His early education included attending Aitcheson College (Lahore), Grammar School (Karachi) and Karachi American School. Mr. Anwar was the founder and President of the Pakistan Bankers Association, U.K. from 1997 to 1999. He was also a member of the Arab Bankers Association, U.K. In New York, he had served as an Executive Director on the American Turkish Society, Director on the US-Pakistan Economic Council, Director on the American Middle East Business Association and Member of the Council on Foreign Relations.